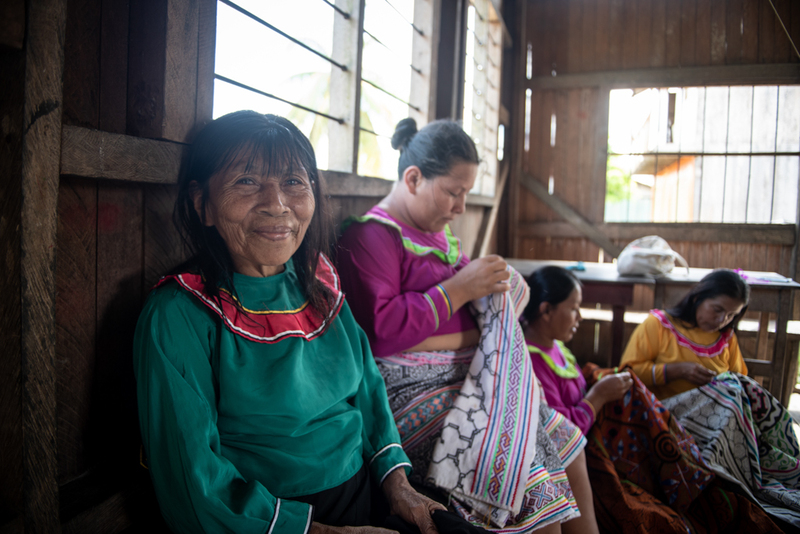 In the Peruvian Amazon rainforest, women from the Callería community of Indigenous Shipibo-Conibos, combine traditional dyes and local crafts with modern design to create beautiful textiles. The natural dye is made from bark and plants growing in their FSC-certified forest, and is used to create unique pieces of art. Each Shipibo-Conibo woven and patterned item is spontaneous and unique to each artisan woman, inspired by ancestral graphic structures. Sometimes the patterns could even stem from a dream or a song. The textiles are made into bedding, tablecloths and their newest product, textile lamps. To the community this is not only about beautiful patterns. The women are drawing from their heritage to create a brighter future for themselves and their families. In Indigenous forest communities like this, women often don’t have the opportunity to earn money because they are traditionally family and household caretakers. But this tradition is changing, and an initiative like this one empowers women. In an area like the Amazon, where illegal logging and forest conversion are big problems, maintaining the forest and making it part of the solution for a modern life is crucial. This is why FSC Peru has been deeply involved with supporting the activities of the community. Healthy forests are important, not only for the planet’s biodiversity and climate, but for local people too. As an example, in this community, fishing forms a large part of the food source. But fishing is threatened by the contamination of the rivers stemming from conversion and unsustainable forestry happening upstream. The Calleria community of about 300 inhabitants is one of five small communities sharing an FSC group certificate. The project is working with FSC non-timber forest products, with a special focus on natural dyes. These products are part of the community’s FSC forest management plan, and will hopefully extend the scope of their FSC certificate in the next certification audit.